As part of the aftermath of the Coinage Act of 1890, the silver coins, the dime, quarter and half dollar, were all redesigned. These designs, were done by then U.S. Mint Chief Engraver, Charles E. Barber for whom this series of coins is named. The Barber series of coins was issued from 1892 until 1916, although no half dollars were minted in 1916. The Barber Quarter was replaced in 1916 by the Standing Liberty Coin when the Barber Quarter was “retired” after a 25 year run. 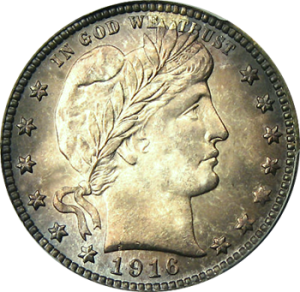 There became a consistent public call to replace the Seated Liberty Quarter in the late 1880’s since that series of coinage had been in use since the 1830’s. Coin specifications were established over the previous years by government regulation such as the Coinage Act of 1834 and the Coinage Act of 1872. This meant the Barber Quarter was 90% silver and 10% copper with a diameter of 24.3 millimeters and a weight of 6.3 grams. The Barber Quarters were minted at Philadelphia, New Orleans and San Francisco as well as Denver. However, production of Barber Quarters from the Denver Mint didn’t begin until 1906 and production at the New Orleans Mint ceased in 1909 when it was shut down. While common Barber Quarters in Good condition run in the $10 to $20 range for commons, there are notable exceptions with additional value, mostly due to low mintages. These are the 1897-S and 1914-S which run in the $70 range and the 1896-S in the $1000 range for Good, the 1913-S in the $1700 range and, of most note, the 1901-S in the $6000 range for Good and a huge step to around $13,000 for Very Good. The reason for the majorly increased value for the 1901-S is due to the fact that only 72,664 Barber Quarters were minted in San Francisco that year.